It should not be a surprise that Physcians are not fans of Microsoft products — namely Windows and Internet Explorer. Much of this hatred is due to hospital enterprise solutions still using outdated versions of Internet Explorer. Ask a physician friend to fill you in if you need a better idea. On a personal note, I had been dreading the forthcoming Microsoft tablet because I know Microsoft products make Hospital health IT departments salivate. We commented last year how many Hospital IT cite physicians using the iPad at work as their biggest headache. I knew as soon as Microsoft launched a tablet Hospitals would gravitate towards the product, no matter if it was good or not — but because of “legendary” Microsoft enterprise solutions. I was set to start the countdown to purgatory — when I would be forced to use a Microsoft tablet in the Hospital wards. But after reading about the event, and looking at videos and pictures of the Surface, I felt an odd emotion — excitement. Microsoft has actually laid the framework to a compelling device. In an odd turn of events, their lack of hardware expertise has actually benefited them in the post-PC ear. Whereas Apple has to make sure they differentiate their hardware product lines, Microsoft does not. Apple has to make sure users purchase a tablet and a laptop, doing this by limiting the scope and functionality of iOS, along with hardware limitations — Microsoft doesn’t care. They are more than willing to include a robust OS — Windows 8 — with included HDMI and USB ports. All these features have enabled Microsoft to bring a unique device to the market, one that truly defines the Post-PC era. According to journalists at the event, the tablet delivers the feeling of superior build quality — crucial for physician adoption. Microsoft talked at length about how the case has a “VaporMg” finish to deliver a clean and sturdy look. Having a keyboard is a necessity if you want to use your iPad in the medical arena. It is impossible to do meaningful charting of patient histories using a touch screen — especially when it takes up half your screen’s real estate. The Microsoft Surface has a keyboard that doubles as a case, easily increasing your level of productivity. In the past we have discussed extensively why doctors are fans of stylus input. We have written extensive reviews of various stylus pens for the iPad. Microsoft’s inclusion of a stylus pen that blocks the input from your wrist while making annotations is another boost from a productivity standpoint. This enables physicians to write quick annotations on patient charts, and also their personal medical literature files. While HDMI and MicroSD ports can be added on as accessories to the iPad, no one is holding out hope for USB 2.0. In the medical field USB 2.0 is essential for peripheral devices, such as ultrasound probes. So, why is USB 2.0 host support essential if you want to connect an ultrasound probe to a smart phone? At a basic level, the probe has to be able to draw power from a mobile device. Many other medical peripherals function in the same manner, and I wouldn’t be surprised if medical device companies target the Surface as an ideal pairing device for their products. One of the biggest advantages of the Surface is the operating system. A mobile friendly version of Microsoft 8. Having a full functioning OS on a small form factor will increase productivity for medical professionals. Enabling us to run programs we would otherwise not be able to. A mobile specific app or web interface is no longer required to run software. It still remains to be seen if Microsoft can continue to impress when the Surface actually launches. I remember being this excited when Palm launched the Pre, only to be disappointed with their quick downturn. Obviously, Microsoft is a completely different machine with lasting power and funds to back it up. One thing is for sure though, the Surface has the opportunity to be relevant in the hospital space, and my fellow doctor’s can stop being scared now. Personally, I can’t wait to try one out. The Surface tablet will bring an end to the BYOD era in healthcare. IT departments will be able to manage and secure this new device as it fits nicely within their existing Microsoft ecosystem. The convergence of the Microsoft Platform around Windows 8/Metro UI will make enable users to have a consistent experience from the phone, tablet, desktop and server. This is a game changer in the enterprise market. Hopefully this will be the compelling technology that will finally get healthcare IT and EHR vendors like EPIC and GE Centricity to utilize the modern and more secure browsers in their solutions. I think Microsoft’s hope is their device will replace existing devices in the BYOD era. But you’re right, I really do think this is a game changer. I think the more important question is whether EPIC and GE will finally get their acts together and provide legitimate mobile solutions, and I agree — I think they will. Unfortunately, pricing is not fully disclosed. Indications are that pricing will fall in line with Apple devices with similar specs/features. This could prove problematic for MS in gaining market share in and out of the enterprise. The lowly consumer might have a hard time dropping that kind of cash on a not-Apple product when many are as much interested in the “cache” of the device as the performance. Enterprise is going to be hard pressed in these economic times to justify the costs associated with significant deployments of such devices. Deployments in smaller numbers might prevent the rapid word of mouth momentum that would help penetrate market niches. Of all the companies with deep enough pockets to have learned a lesson from HPs blowout pricing NOT to have made the SURFACE a great device AND an excellent price point option, MS may have doomed the device to a slow adoption rate in enterprise enviornments and a non-starter in the consumer environments. I don’t full agree with this. I actually think that Microsoft will have “cache” with this device and sell plenty of them. They really have created the ultimate post-pc era device in regards to productivity and form factor, and I think consumers will reward them for it. Obviously, they won’t have the same exact cache that Apple seems to demand, but many are excited about this device. This device will also offer considerable appeal for allied health professionals, many of whom regularly visit patient groups in their own home. Powerful, flexible mobile platforms are a huge boon for delivery of health services. Agree with you on this Stu, definitely huge for health care professionals who visit nursing homes or visit patients in their homes. A lot of mid-levels do this type of work as well, so I would assume they would love a powerful and flexible platform. I am a nurse practitioner and make home visits for a large community health entity. We have laptops but they are large and bulky. It would be great to carry around an ipad or surface to homes. Thanks! 1) Hardware – This maybe a quality tablet, but this is just one of many Windows 8 tablets to come. I won’t get into the dynamics of Microsoft competing against their hardware partners (a lot of speculation on the long term plan around this), but the Window 8 platform will suffer from the same disjointed hardware problems that Android has. I am hoping they work out most of those issues, but time will tell. 2) Keyboard – Do you usually walk around with the smart cover on your iPad? Or does it get in the way? Or do you see this being attached when you are back at your office? Just curious on how often the keyboard will be attached to the tablet. Also I am sure by next year you will see 3rd party vendors with a similar type keyboard for the iPad instead of the bulkier keyboards already on the market. 3) Stylus – This is pretty big if its accuracy is on point. The one huge flaw is the stylus will only be used by the Intel based Windows 8 tablet, not the ARM based Windows RT tablet – putting this out of reach for the price sensitive (see point 5 below for more on this). 4) Ports – I agree, big advantage here. 5) OS – you will not have a “full functioning OS” at the price point of an iPad with the Surface tablet (when other vendors announce their tablets I am sure this will change). There are two models of the surface, 1) Intel based, Windows 8 tablet – has full functioning OS, pen, etc. This will be “on par with Ultrabook-class PCs” – expecting to see around $1,000. 2) nVidia ARM based, Windows RT tablet – limited to metro style apps – requiring software vendors to re-write their code, so don’t expect to “run programs [you] would otherwise not be able to” – expecting similar price to iPad. The increased competition alone will be great for the industry. It will be an interesting few years to see these two battle for market share. 2) I think the main thing is the keyboard aspect. When I have used my iPad for rounding on patients, I just flip my smart cover back. What I need though is a keyboard when I want to write notes. If the cover is implemented in a non-intrusive manner, the keyboard aspect alone would be a tremendous for medical professionals. 3) Agree with the accuracy issue on this point. Having the “wrist block” action alone is pretty huge though. I’m hoping they are using a similar implementation as the Galaxy Note for this. Good point on the various price points it will reach. For enterprise, I imagine the higher price point will still be cheaper than some of the other “enterprise” tablets on the market. Agree that at the end of the day competition is great. If the tablet is a success, it will really force Apple to reconsider adding key functionality and productivity enhancements to the iPad. But again, as I mention in the article, Apple does not have an incentive to do this. They want everyone to have an iPad AND a laptop — it’s good business. Microsoft, on the other hand, doesn’t care. They just want their OS on devices. I think this aspect is what makes the future years to come so interesting. Hype about a future release of a Microsoft product is getting old. By the time it comes out and (fails a bit and have several iterations) IT people just go for it. Most physicians will own an iPad, a newer one with new features that overcome its present flaws, while a Surface II will be in the planning with a two years old delay. Microsoft has such a great business model: put out crappy products that people cant use. X-Box. Micosoft produced. Best console on the market. Great marriage of hardware and software. Microsoft has produced subpar products before, but it doesn’t mean they always do. They have had some great hits. I’m actually using a similar set up. The Logitech Ultrathin Keyboard Cover is great for mobility. Agree we need to keep an open mind, especially since the iPad is limiting from a productivity standpoint for physicians. WOW ? This is an interesting story. So if I buy this MS tablet I will have how many apps? It’s not about MS office, evertiPad user has a compatible Office app. The Slate will be like the windows phone and all other so called iPad killers. DOA. Legacy apps will work on Surface Tablets so thousands of applications on day one. The Surface Pro is not a competitor to the iPad. It is an entirely new class of computing device, which is the natural convergence of the computer and the tablet. Windows Phone 8 will share the same kernel as Windows 8 Phone, means it will be possible to write drivers / applications for medical devices that can move from phone to tablet/computer. In addition, the ability for enterprise IT to remotely manage all their Windows devices from phones to tablets to computers, is compelling. That enterprise IT will be able to write and install their apps directly on to their devices WITHOUT posting them to the App store, is also compelling. The Surface Pro, with its HDMI & USB 3.0 is a computer, where I can install Visual Studio 2012, SQL Server 2012, and all my other work tools. It has the same i5 processor as my XPS 15. When I connect it to my 28in monitor and keyboard/mouse, it becomes a creative Surface. When i need to show it is an entertainment Surface. The natural convergence. Great points Frank. I think apps themselves are important, but from a productivity and enterprise standpoint it’s not going to be a deal breaker. What’s the point of having over 100,000 apps when I can’t use a mouse to quickely fill out a patient’s electronic medical records ROS section. Would love to see a dedicated tablet for use in healthcare settings. My suspicions are that this hasn’t been done already because the thousands or even hundreds thousands of units that could be sold to hospitals and healthcare professionals pales by comparison to the millions of tablets being eagerly gobbled up worldwide in the consumer market. Motion Computing seems to be further along than others but has perhaps been hampered because of past windows operating systems that were used. Maybe with Windows 8… I’m anxiously awaiting the perfect solution. Or at least a better solution. From somebody. Please. This hasn’t happened up till now, because there are very serious issues with managing enterprise level security on the iPad. Another issue is that even apps designed to internal enterprise use have to go through the App Store. 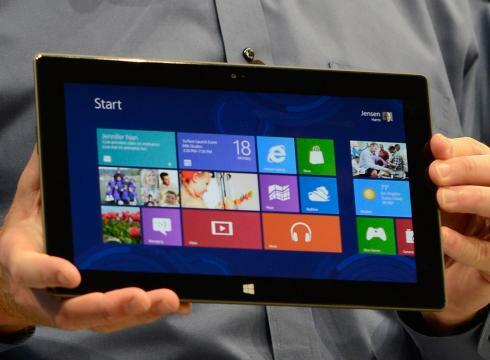 The windows8 tablets will allow IT departments to install native apps without going thru windows marketplace. Additionally, because it is a computer, in tablet format, enterprise IT can manage the entire device thru their standard IT network policies. The problem is not managing iOS devices, but the failure of EMR vendors to come up with practical solutions — they just try to fit their software on an iPad screen — and the lock-out of independent developers. I don’t think it’s completely the fault of vendors. Sure, Apple does offer these features — we’ve written about them extensively on iMedicalApps before, but can a company actually go to them for trouble shooting? To be more exact, if you’re one of the “smaller” EMR companies, will apple even return your call if you want to trouble shoot with them? Traditionally Microsoft has been tremendously better at offer Enterprise level solutions for companies of various sizes. Oh I agree, the vendors are on their own. Not sure what you mean “troubleshoot with Apple”, every developer gets 2 one-on-one tickets per year for free, you can purchase additional ones; maybe you get more for the enterprise package. But I don’t think “troubleshoot with Apple” is something you as a developer need to do, documentation is fairly thorough. Or are you thinking of something specific? I’m not saying it’s the fault of the vendors because they don’t provide better solutions, it’s their fault because they sell these locked down systems and go all the way to prevent someone breaching into their domain (i.e. the hospital they conquered). THAT’s a huge problem and entirely their fault. The overall point I was trying to make is that if I’m a vendor/hospital/or practice — and I’m going to spend thousands or hundreds of thousands on an EMR solution or developing an EMR solution, I would go with the company that provides the best enterprise support. I do agree that vendors need to do a better job of tailoring solutions for mobile in general, not just the iPad. They are ready doing this though — look at our review of Nimble and Dr Chrono. Those EMRs aren’t exactly selling like hot cakes, even though they were built just for the iPad. I agree. You are absolutely correct about security. PPI and EMRs should never be put on non-secure devices. Therefore, while the iPad is excellent for point of care research, information retrieval, and patient education and can also be a very useful, portable productivity tool, what we really need is a tablet or a convertible, or something like the Surface, something that is rugged, light, easily sanitized, and waterproof that is secure and can support an EMR.